The long axis of the lake runs approximately East-West (bottom-right to top-left in photo) crossing the two basins that make up Ongeim'l Tketau (the eastern basin is the shallower, at 25m deep). Surface waters are well oxygenated, but the lake is anoxic below approximately 15 m (see figure, below), the depth of a well-developed chemocline and dense population of purple-sulfur bacteria (Chromatium sp.). Visibility generally is quite poor, with an average Secchi disk depth of about 8 meters, although this can vary substantially from week to week. The most obvious animal in the lake is the golden jellyfish (Mastigias sp.) which at times numbers over 10 million (Martin et al. 2002, CRRF Tech. 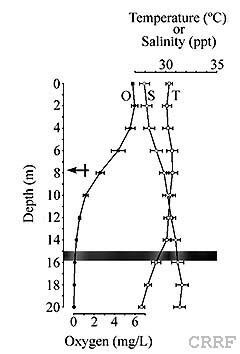 Rep. 2) and reaches densities of hundreds per cubic meter when daily migrations cause medusae to aggregate near the shadowline. Learn more about Mastigias migrations. Ammonia sp., Helenina sp.1, Bolivina variabilis, Elphidium sp., Textularia cf. T. foliacea, Planorbulinella larvata, Glomospira fijiensis, Pseudotriloculina sp.1, Brizalina striatula, Siphogenerina raphana, Quinqueloculina incisa, Cycloforina sp. Sources: CRRF unpubl. data; Fautin & Fitt 1991; Hamner & Hamner 1998; Lipps & Langer 1999; Monniot & Monniot 2001; G. Paulay pers. comm. ; K. Tilbrook pers. comm.